Man UTD to beat Everton @ 25/1 with Coral + £5 free bet! 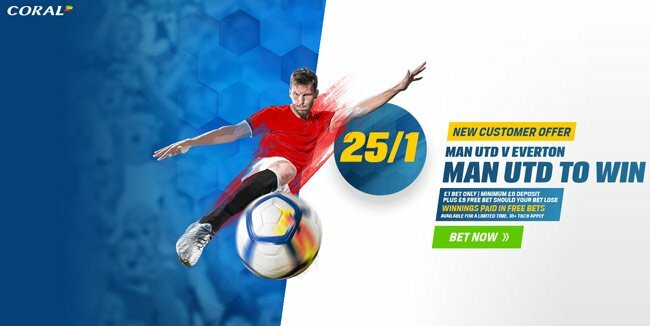 Manchester United host Everton on Sunday afternoon and Coral are offering all BetAndSkill readers the chance to back Manchester UTD to beat Everton at 25/1. Plus, you will receive a £5 free bet should you lose! Manchester UTD are unbeaten in their last five games in all competitions, picking up four wins and enter this clash on the back of a 3-0 Champions League victory over FC Basel. They top the Premier League table after taking 10 points from a possible 12, scoring 12 goals and conceding just twice in the process. Join Coral before the kick-off on Sunday (5.00pm) for 25/1 Manchester UTD to beat Everton instead of 1/3!! Make your first deposit of £5 or more and your enhanced odds will appear on home page - 25/1 Manchester UTD to win vs Everton! Coral are offering all new customers a tasty 25/1 for Manchester UTD to beat Everton (was 1/3), click here to claim your enhancement in few simple steps! Offer available to UK & Republic of Ireland residents aged 18 years or over opening a new Online, Mobile or Coral Connect account in either £/€ currency through https://promotions.coral.co.uk/landing-pages/crazy-prices4,https://promotions.coral.co.uk/landing-pages/crazy-prices-online4 or the specific offer promotion box from coral.co.uk/sports/offers, between 08:00 BST Monday 11/09/2017 until Tuesday 19:45 BST 12/09/17 with the exception of new accounts depositing funds with Moneybookers, Paysafe, Neteller or Skrill. Place your FIRST real money bet as a win single £/€1 on ‘Man United to win 25/1’ in our “My Markets” sections. "Man UTD to beat Everton @ 25/1 with Coral + £5 free bet!"